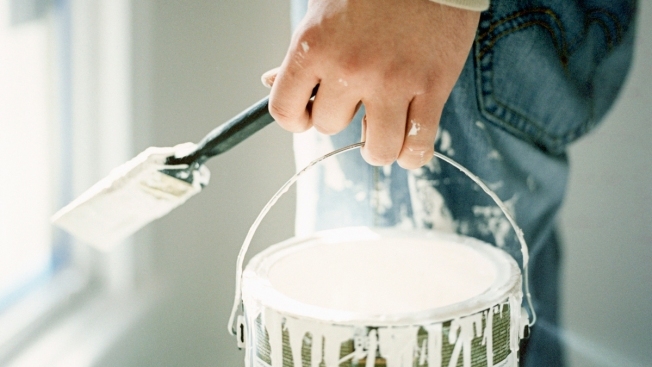 This undated file photo shows someone holding a paint can and paint brush. Paint colors can have a significant impact on the resale value of homes, according to a new report released by the real estate website Zillow. The real estate website Zillow recently released a report showing how different paint colors can impact a home's resale value, "Today" reported. The company looked at more than 135,000 home sales around the country to gauge the way paint colors affected prices and found that color is most significant on front doors. Houses with black or charcoal gray front doors sell for $6,271 more than expected, the report said. Additionally, the report found that living rooms painted light taupe sold for about $2,793 more than expected and bathrooms with light blue or periwinkle walls sold for for about $2,786 more than expected. In the kitchen, the tuxedo cabinet trend — pairing white or light-colored upper cabinets with dark navy or black lower cabinets or kitchen island cabinets — increased value, while kitchens painted red led to a decrease in value.